When it comes to designing the perfect space, there are a lot of elements to consider. You need to incorporate the right textures, colors and functionality in order to make the most of your space, no matter where it’s located. If you’re in dire need of a timeless design feature to bring any space, new or old, up to date, check out the unique aesthetic and diverse benefits of basalt tiles. Norstone has been innovating how natural stone can be used, which includes a variety of natural stone veneer applications. Precision-cut basalt veneer comprises Norstone’s Interlocking Lynia and Aksent 3D tile collections—both of which can be used in nearly any way you can imagine. Kafka Granite is the Midwest’s premier distributor of Norstone products, which means you can get started with adding modernity with a natural twist to your project now. 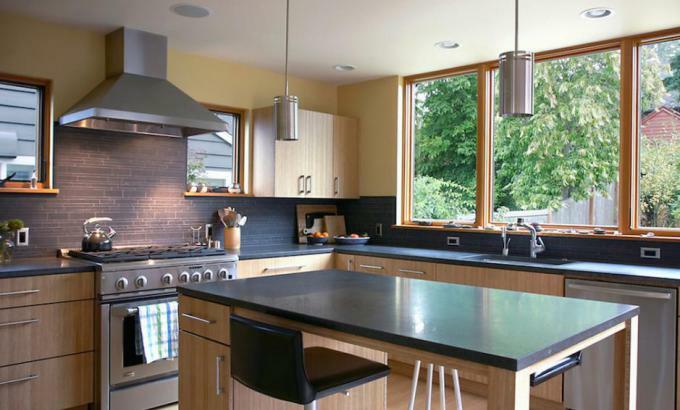 What Is a Basalt Veneer Tile? Aksent 3D Panels: When you truly want your walls, backsplashes, water features (or whatever you like) to make a statement, Norstone’s new Aksent 3D Panels are a surefire choice. These tiles are dimensional, meaning each individual veneer is set on its panel in a precise way that adds depth and vividness to any area. Lynia IL Tiles: Unlike Aksent 3D Panels, these mesh-mounted tile sheets are made up of nine staggered precision-cut basalt tiles that are set at a uniform height. Each tile is .4” to .6” in thickness, creating a sleek, uniform look across your project’s surface. When you think of installing tiles on any project, your mind might instantly jump to thoughts of endlessly placing individual pieces. The time-consuming placement of spacers and working with single tiles over large spans of area is distant memory with Norstone’s basalt tiles. Both IL and 3D options arrive pre-assembled. They are expertly crafted so that each unit perfectly interlocks with its neighboring unit. Stepped edges ensure a cozy fit as well as a natural, varied look instead of long stretches of vertical seams. By requiring very few tools and minimal experience, these have become some of the easiest tiles to install. Simply apply a scratch coat of a polymer-modified thinset and lay your pre-assembled sheets. Lynia IL tiles require the use of unsanded grout once the thinset has cured, but Aksent 3D panels don’t require grout so to better achieve the dry-stacked stone aesthetic. Both varieties require a natural stone sealer since basalt is a porous surface—doing this will ensure your basalt addition stays gorgeous for years to come in any environment. 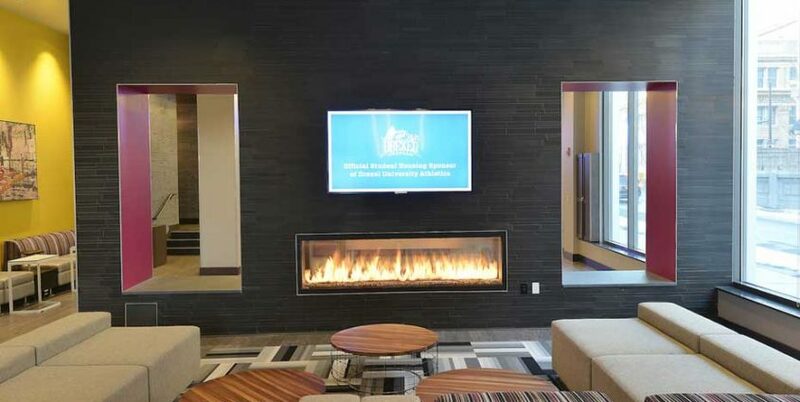 Norstone’s basalt tiles can be used in virtually any setting: feature walls, backsplashes, bathrooms, shower enclosures, retaining walls, water features, indoors or outdoors. Anywhere a contemporary feature could make the perfect statement, these tiles can be used. These are four instances where a drab wall was ditched in lieu for a sleeker, sexier design. There are a few reasons the Gray 3D Aksent Panels used in this bathroom really make the space what it is. The modern yet natural look and feel of dimensional tile made from a natural stone is mimicked by the modern bathtub that’s made warmer by a wooden surround. 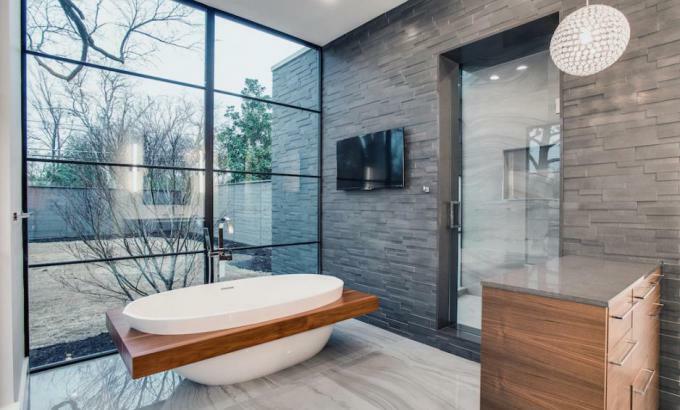 This bathroom feels both modern and midcentury through its fixtures and aesthetic. 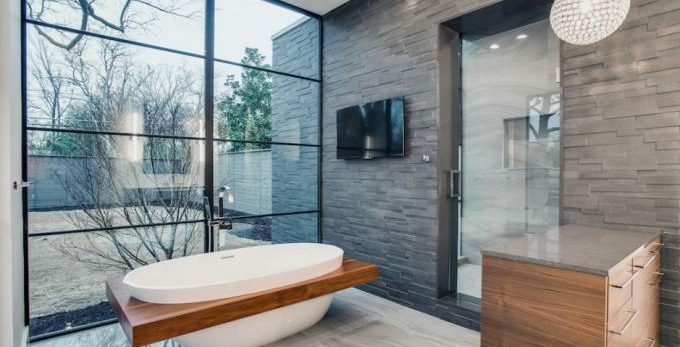 However, what really makes this bathroom stunning is the extension of the basalt tiles from indoors to the wall outside, which makes the room feel large and as if it’s extending outside. The versatility of Norstone basalt tiles is being used to its fullest here. Whether you are designing the perfect kitchen in the home or looking to create a professional and durable commercial kitchen, Lynia IL Tiles can bring any kitchen into modern times. Bring incredible design to an incredible space with sleek and durable basalt that can deflect whatever food comes its way. When creating a focal wall, it’s easy to pick a tile material or pattern that becomes overwhelming or too busy on a large scale. The smooth texture and cooling grays of basalt are soothing to the eye, even in big proportions, and won’t have you worrying if you chose too much of a good thing. Picking a pool’s surround is a big job. It sets the tone for the area whether it’s indoors or outdoors, so being on-par with the surrounding aesthetic is important. However, it has to be a material durable enough to stand up to rowdy poolgoers, varying temperatures and constantly running water features. 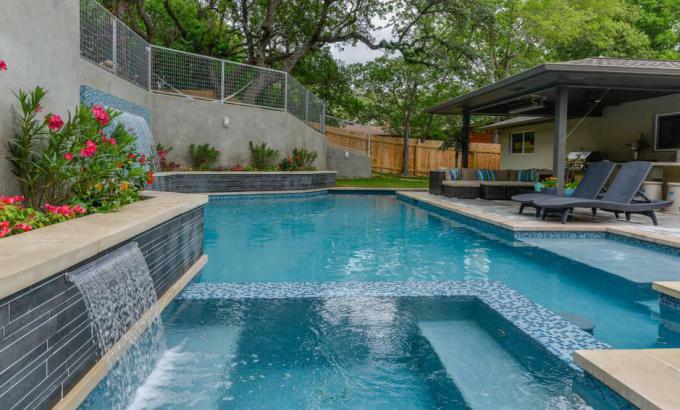 This pool and water feature are brought into a sleek and modern design with the use of Gray Lynia IL Tiles. Where the designer could’ve stuck with a bland cement surround or a blue liner, they chose an option that will stay trendy and contemporary for decades. When it comes to designing the ultimate contemporary space using all-natural materials, look no further than basalt veneer tiles. Get in touch with Kafka Granite today to find out more about the dynamic uses and durability of Norstone Tiles. Whether you need the ideal material for indoor or outdoor use, dry or wet areas, basalt can provide the natural yet modern appeal popular today for any room you’re working on.